“Strikeforce: Feijao vs. Henderson” took place Saturday night inside the Nationwide Arena in Columbus, Ohio. A pair of thrilling title fights headlined Showtime’s broadcast. Women’s 135-pound champion Marloes Coenen rose from the brink of defeat to unleash an Anderson Silva-esque come-from-behind victory over Liz Carmouche in the night’s co-main event. Coenen was getting mauled by the 3-to-1 underdog until she manged to wrap her lanky legs around the challenger’s neck in the 4thRound to force the triangle choke submission victory. 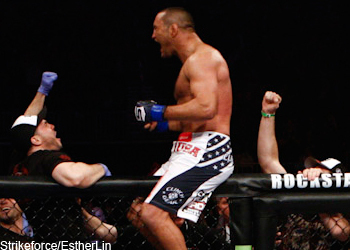 Dan Henderson captured the light heavyweight crown in the card’s featured contest. After much back and forth action during the first 10 minutes of their championship affair, Henderson came out firing to start the third stanza. Henderson connected on a vicious right hand that instantly dropped Rafael “Feijão” Cavalcante on his face. The former PrideFC champ quickly pounced on Feijao and unloaded a few more bombs on the ground before the fight was finally called. Speaking of finishes, Strikeforce produced yet another night of spectacular action. It’s becoming old hat for the San Jose, California based promotion, as eight of the 10 fights on Saturday did not involve the three officials sitting cage-side. The two contests that went to the cards resulted in lopsided unanimous decision verdicts. “I kind of wanted to be real patient in this fight. Obviously, I would have liked to have knocked him out in the first minute. He’s a tough guy. I wanted to be patient, hopefully win each round, and then catch him in that third, fourth or 5thRound. Kennedy asked for Robbie Lawler if Strikeforce brass didn’t give him a rematch with reigning middleweight champ Ronaldo “Jacare” Souza.